Area of interest: Lead mines and soughs, Wirksworth area, Derbyshire. Artefact collection: Donated to Peak District Mining Museum. or access controlled: Access to mines in the Wirksworth area. Underground visits must be accompanied by Group members. Current projects:	 Bage Mine and Alabaster Sough. Services:	 Two powered winches and two generators. Club Headquarters: Bage Cottage, Bolehill, Wirksworth. Last updated: 30/10/2017	 The Peak District of Derbyshire undoubtedly has many more secrets to reveal in addition to the Wills Founder water pressure engine pictured left. 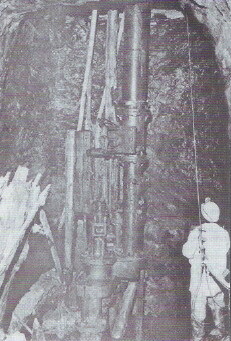 The engine was found in 1975 by members of the North Staffordshire Mining Club 360ft down a vertical shaft. Many organisations were subsequently involved in 1976 with the raising of the engine. Help consisted of the donation of equipment or financial aid plus a whole team of helpers as the recovery work progressed. The engine is now on public display in the Peak District Mining Museum, Matlock Bath, Derbyshire. The photograph by P.R. Deakin, shows the engine in-situ just prior to Its recovery.